Like Xmass. Trailer is almost done. Will finish in the AM and pack it up. Car needs a few adjustments done. Battery tie down put in rear deck back in and set set back into place. We should be on the road before 9am is the game plan. Wewill be speding the night too. Well its 1am rail is done (just need to wire some lights) gotta pick up my daughter at 7am then load the trailer & truck hope to be there about 9am. Mini map to location - We are just a little east of marker "B"
Huge Thanks To Tony and everyone who made this years event possible. Awesome Prizes and very fair games that everyone had an opportunity to join in. Thank you so much and we can't wait till next year! Thank you, thank you, thank you, to MC Tony for making this such a great event, and thank you to everyone that came out. I don't know how we are going to top this year. Rail = broken pressure plate, and throw out bearing. Orange Baja, 1 flat, as well as some sort of clutch issue. Great time. big thanks to everyone who worked hard to put this event on again this year. Awesome Prizes and very fair games that everyone had an opportunity to join in. I Agree!!! the games were on target! they were EZ and everyone regardless of what you drive you could participate in. P.S. --- Sorry my boy kept taking bites out of the "Nerf toys"..
Wow, sorry to see that! Hope all those shavings are just from the trans housing and it just needs to be properly torqued. That flywheel looks like it was super hot at some point. Ya it got hot from when the first time I had to change clutch. now you need to find someone that can 8 dowel the crank with out removing the crank..
Glad everyone had a good time. BIG SHOUT OUT to Greg from the PepeAzul team. His ribs were AWESOME. Thanks for being the chef at dinner time Greg. 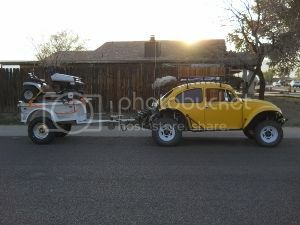 Just got back to vegas 5:00 pm monday I think this is the first time the buggy has come home in 1 piece we had a great time I may have to start a new project just to use these cool a** lights we won but the best thing for us was just being able to hang with a bunch of great folks thanks guys.